What are the most likely things to be smuggled out of Mexico? Especially those funny-looking cartoonish cacti. The bright green ones with the long arms that look like Gumby with spikes. On menus, you might see them wearing sombreros. The one bit of flora that says more than anything else: you are in the West, bucko. Instead it’s “Go East, young cacti!” These succulents are being snatched from the ground and FedExed to landscaped yards in… Scandinavia, Japan, and the Czech Republic. Go figure: In the southwest of the U.S. of A., where landscapers are paid big bucks to wrest a lawn out of the Sonoron desert, these things are like weeds. Those owners would prefer the water-sucking green grass of “home,” meaning some place out East with picket fences and streams and lakes and people with time on their hands to cut the grass. Oh, sorry. Rant over. While there are cacti nurseries in places like the Netherlands, illicit traders and collectors will raid sparsely inhabited Sonoron landscapes to find rare specimens much in demand. 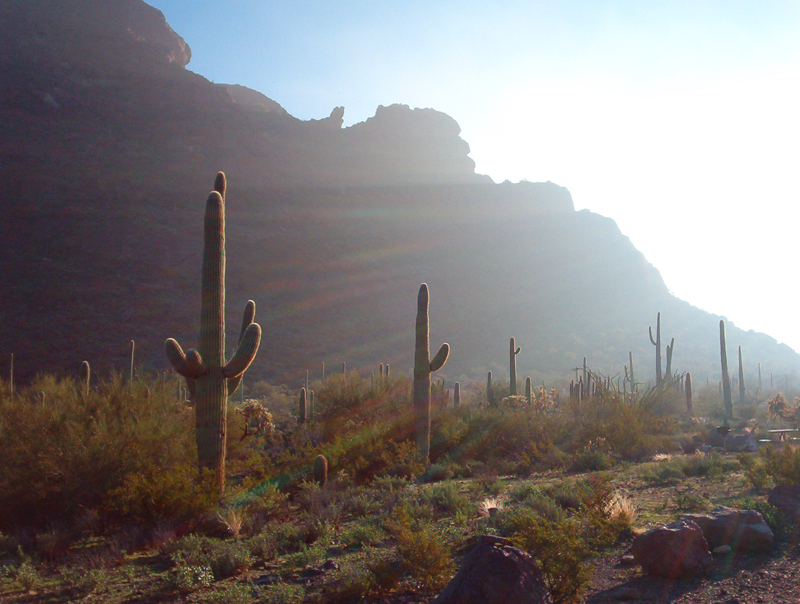 * The saguaro is not rare, but its shallow roots allow it to be plucked intact from the soil. How they carry the spiny thing is beyond me, but at $60 per foot, bigger is better. And that combination of bucks and bigness spells tragedy for the iconic cactus, which takes a long time getting to its famously recognizable form. ** It grows about one inch per year, and about 60 to 70 years to grow an arm. Having seen them at close hand, in their Sonoran homeland, I can safely say that those smugglers are crazy, that it is criminal to remove those giants, and that saguaros are actually pretty ugly. I mean, of course these cacti are beautiful, but they little in common with those bright green picture-perfect cartoon caricatures. 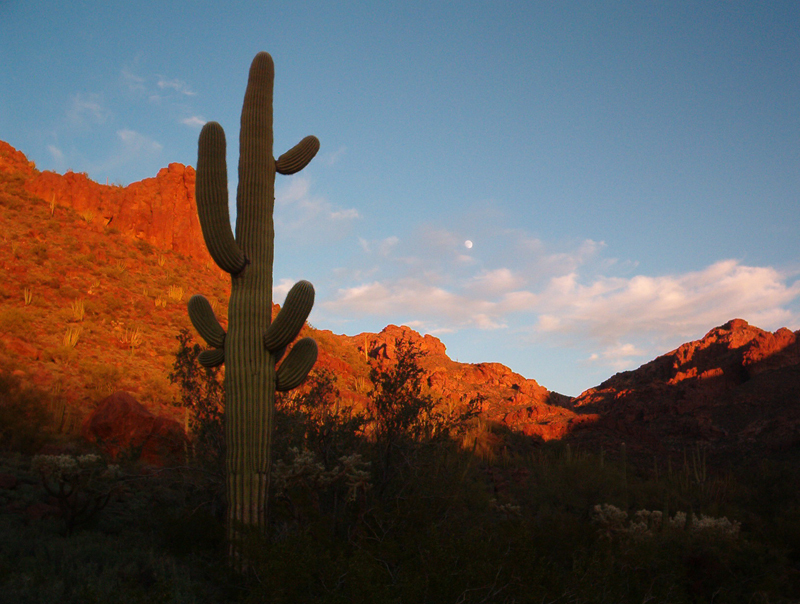 And those coyotes with bandannas around their necks sitting beneath the tall saguaros, yipping at a full moon ? No. Whoever came up with that bit of Western kitsch should be whipped by ocotillo. The saguaro’s flesh is as hard as a rind, often rough and gnarled and scarred. The color is gray-green, brownish green, deep green. All greens. The spines are wicked long, ringed and curling a bit, like the fingernails of Howard Hughes. The arms bend and twist and curve and after a while as you hike or drive, you will start to feel anxious, as if there are people who are following you. You turn around swiftly–nothing. You sneak a glance casually over your shoulder–nothing! Dr. Julian Winston: You’re getting as prickly as your damn cactus! * Why they can’t just take those damn prickly pear is beyond me. Those things cling to your shoes like desert barnacles. ** Once I saw a cell phone tower in Arizona in the shape of a saguaro. I think they were trying to camouflage the contraption. As a fifty-foot, alligator green, shiny, fake cactus.